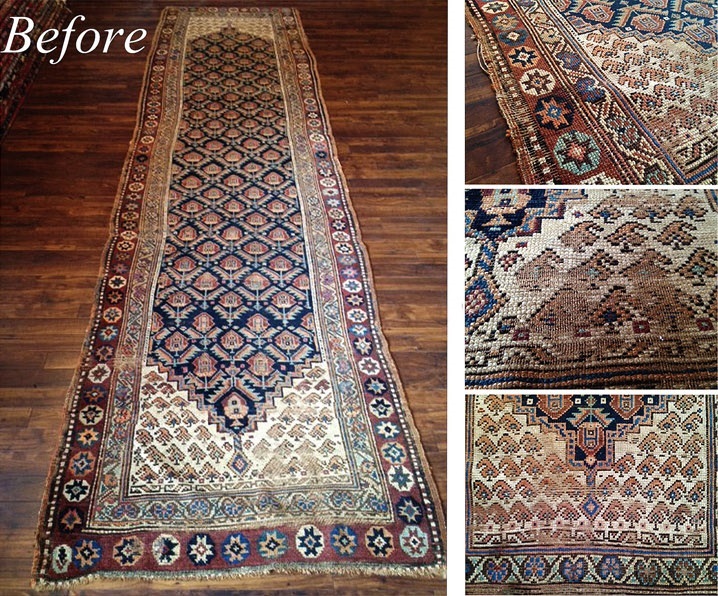 Like most items, regular maintenance can help to prolong the life of your rug. It is far more cost effective to have small maintenance issues addressed as they arise, rather than allowing further deterioration. Small restoration jobs, such as securing the ends, fixing the fringes and restoring frayed selvedges are relatively low cost jobs to have done but form a valuable part in maintaining your rug and increasing its longevity. Another maintenance issue that is commonly overlooked is small holes. When a small hole appears in a rug, it may be due to removal of the pile, or a hole forms in the warp and weft (or foundation).We advise our customers to get these holes expertly repaired before further deterioration. Restoration techniques are such that these small holes can be repaired and become undetectable once fixed. If holes are allowed to deteriorate, restoration is still possible, but can be more costly.